Every guy should own a sport coat/jacket. The terms get interchanged these days as sport coats have taken on a wider range of styles. The sport coat should become a very common piece amongst your daily wearables, almost a second skin. This piece can separate you from the average Joe in a crowd by bringing your dapper level up a notch or two. There are a few crucial things you should look for when purchasing your sport coat to make this a versatile piece that you’ll find yourself wearing often. You want the sport coat tailored to fit you just right. You want the silhouette to follow your body close, outlining your shape, and slimming arms. It should be the correct length (discuss with your tailor). 90% chance you will have to get it tailored. Just do it! You want to find a relaxed structure; you don’t want it to have the look and feel of a suit jacket. This is a more casual jacket. Typically 100% cotton. Makes washing easy and gives the unstructured look and feel we want. Boxy fit – refer to the top key above. Shoulder pads at all cost – they look dumb and not dapper! Below is an example of a properly fitting Sport Coat/Jacket. Picture: George D of Atlas & Mason. Follow his Instagram for Style Tips. The beauty of a sport coat is you can wear it with a wide range of options, and to a wide variety of places. It is easy to dress up or down. You can wear it to work, on date night, while watching a football game, out to watch your kid’s games, or just running errands. You can dress it up by wearing it over a nice button up, and throwing in a pocket square. Or dress it down by wearing it over a V-neck T-shirt, or 3-button Henley, and some nice dark denim jeans. Rolling the sleeves up is a cool way to relax the look as well, which is why you want to look for a 100% cotton coat with an unconstructed fit, as it provides you with more options. A bonus to wearing a tailored sport coat is it can hide a poorly fitting shirt — not something I recommend, but you can pull it off with a properly fitted sport coat. One last thing I would like to cover is color. I personally would recommend navy if you can only have one. 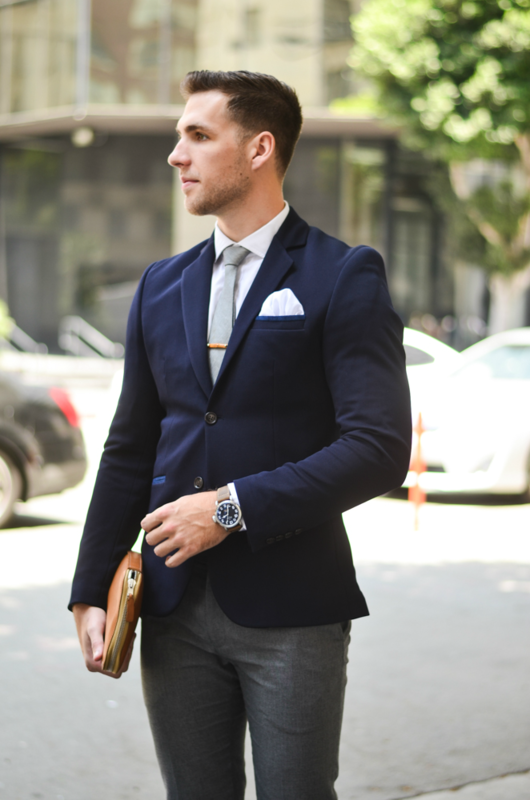 Navy can be worn in most situations and fits the purpose of a sport coat well. If you came to me and said you could buy one new item to spruce up your wardrobe, I would say go with a navy sport coat. It is appropriate for more situations than it is not, it is comfortable, and it can be dressed up or down with ease. Get it tailored to fit you just right and you can leave the house feeling like the dapper confident guy that you are.